Mega Sale! Save 26% on the Conduit Fitting and Reaming Screwdriver for 1/2-Inch, 3/4-Inch, and 1-Inch Thin-Wall Conduit Klein Tools 85191 by Klein Tools at Road compass. MPN: 85191. Hurry! Limited time offer. Offer valid only while supplies last. 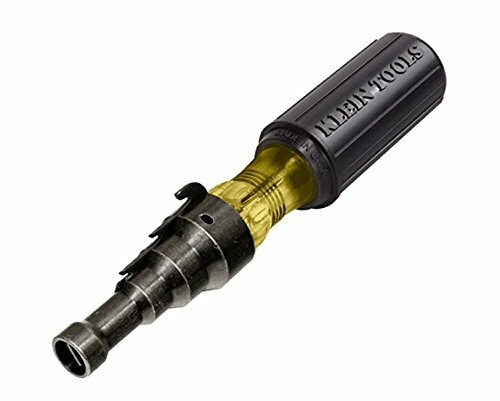 The Klein Tools Conduit-Fitting and Reaming Screwdriver can ream and smooth 1/2-Inch (13 mm), 3/4-Inch (19 mm), and 1-Inch (25 mm) thin-wall conduit. The Klein Tools Conduit-Fitting and Reaming Screwdriver can ream and smooth 1/2-Inch (13 mm), 3/4-Inch (19 mm), and 1-Inch (25 mm) thin-wall conduit. It features a hooded-blade design that keeps the screwdriver tip from slipping out of screws, which is especially handy when tightening hard-to-reach conduit fittings. This screwdriver has a longer Cushion-Grip handle for even more comfort and torque while reaming. Reams both the inside and outside of the conduit at the same time. Thicker hood is designed for rugged use. Ream and smooth conduit ends to protect wire and permit correct installation of fittings. Designed to be used on Electrical Metallic Tubing (EMT). For more than 160 years, Klein Tools has manufactured premium-quality, professional-grade hand tools that deliver the performance, durability and precision needed to get the job done right. Our family of engineers, workers and craftsman continue to put six generations of expertise into every tool we create by using only the highest quality materials, superior workmanship, and keeping manufacturing as close to home as we can. Klein isn't just the name of our company, it's also our family name. And since we're an American company that's family-owned and family-run, you know you can count on us to be here tomorrow. Klein Tools doesn't just make great products, we make great products that stand up to the demands of the professionals who use them every day ... Since 1857.